Lavish gifts of jewels from fiancé, family and friends celebrated a new bride's wedding day. Weddings are a time of tender feelings and delightful anticipation enhanced by happy preparations. In the 18th and 19th centuries, however, the rich were expected to put on a show, and bridal gifts were proudly displayed at the wedding reception. Newspaper and society columns printed detailed lists of the gifts received by the bride with intricate engravings of the most spectacular pieces, a practice that ended in the 20th century when it became obvious this was an open invitation to thieves. The presents to the future Queen of Great Britain, Princess Mary of Teck, were first displayed at White Lodge, the home of her parents, during a garden party to the invited guests. They were later moved to the Imperial Institute where the public could purchase an admission ticket. The revenues went to charity. Conspicuous among the gifts would be the bride's corbeille de marriage, or wedding casket, filled with gifts of jewels from her fiancé, family, friends and, in Princess May's situation, from the country. Along with a fine house, carriage and servants, jewelry was an important and instantly recognizable indication of wealth. When the principle heir of a noble or royal family became engaged, the family diamonds would be reset in the latest style for the bride. 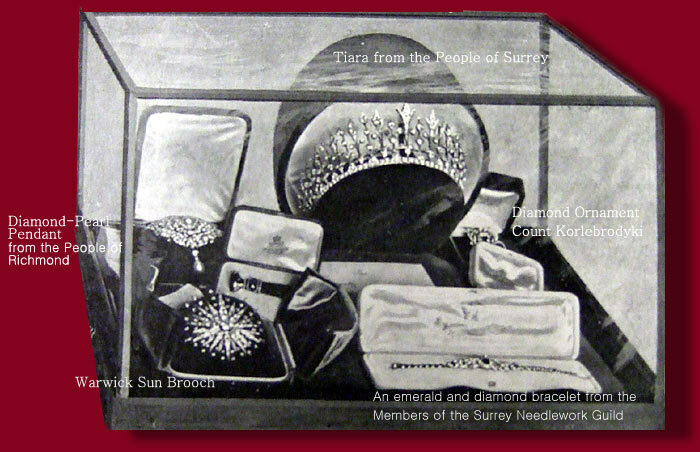 In the glass display case, we see some of the gifts given to Mary such as the "famous" diamond sun brooch from the Count & Countess Warwick, a bracelet which was part of the present from the People of Richmond, and the tiara from the People of Surrey. Some other jewels--the diamond and pearl pendant/brooch from the Ladies of Surrey Needlework Guild and a diamond ornament from the Count Korlebrodyki--have rarely or never been seen in public. The Ladies of Surrey Needlework Guild brooch was inherited by Queen Elizabeth in 1953 and has been worn once in public by the Queen, pinned to her Garter sash when she opened the New South Wales Parliament, in Sydney, Australia in 1954 and later by visiting the Pope in 2000. Queen Mary reportedly had the "Warwick" diamond sun broken up in 1911 and the stones could have been incorporated into new pieces, such as one her large stomachers. See the different brooches above. Princess Mary wore the rose-brooch of Prince George on her arm as a bracelet. The spray of rose-leaves in diamonds brooch on her bodice was the wedding gift from a few women of the stage. Eighty actresses contributed to the fund from which the brooch was purchased. The pearl-collier de chien or pearl dog collar is probably a marriage present of the Sahib Morvi, the Thakore and Ranee of Gondal and later given to the Duchess of Gloucester, was described as large costly diamond and pearl necklace, scroll pattern, with bracelet to match. From the Indian Princes at present in this country, the Princess has received some valuable presents, the Ranee of Gondal giving her a diamond and pearl necklet and bracelet to match, and the Maharaja of Bhaunagar sending her a handsome inlaid Indian cabinet with silver jugs and goblets. Zwei Rosenbroschen besetzt mit Diamanten und eine Rosenbrosche mit Diamanten und Rubinen aus den Hochzeitsgeschenken für Prinzessin Mary, Herzogin von York - der späteren Königin Mary, sorgen für Verwirrung. Eine Diamant-Rosen-Brosche war eines der Geschenke von Ihrem Mann zur Hochzeit, diese trägt sie später als Blickfang als Armspange, oben im Foto gut zu erkennen. Eine weitere diamantbesetzte Rosenbrosche, überreichte ihr das West Yorkshire Regiment zur Vermählung, diese durchbrochen gearbeitete Brosche ist oben rechts zu sehen und wurde von der Goldsmiths und Silversmiths Company entworfen und ausgeführt. In der Vitrine von White Hall ist ein Teil des Schmucks ausgestellt, der zur Hochzeit überreicht wurde. Wir können eine Diamant Brosche in Form einer Sonne von dem Grafen und Gräfen Warwick sehen, ein Armband - rechts, Teil des Geschenks aus Richmond. Ein Diamant Schmuck und links eine Anhänger mit Diamanten und Perle, die später wohl von Königin Mary umgearbeitet wurden - evtl zu auch in diese grosse Korsagen-Brosche, die sie ganz oben trägt.